The Anthony Munoz Award: Bestowed on the offensive MVP. The Lemar Parrish Award: Bestowed on the defensive MVP. The Jim Breech Award: Bestowed on the special teams MVP. The Eddie Brown Award: Bestowed on the team’s top rookie. The James Brooks Award: Bestowed on the team’s best offseason acquisition via trade or free agency. The Tim Krumrie Award: Bestowed on the team’s toughest player. The Bill Walsh Award: Bestowed on the assistant coach with the finest season. The Sam Wyche Award: Recognizing the most controversial or impactful story from the season. 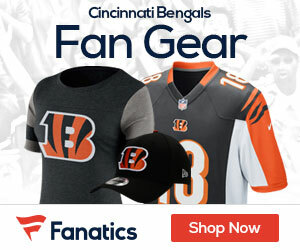 The awards are named after some of the finest individuals to ever wear Bengal stripes in the various categories. It will be our objective to present a choice that respresents the best candidate based on on-field performance, statistics, and intangibles such as toughness and leadership ability. 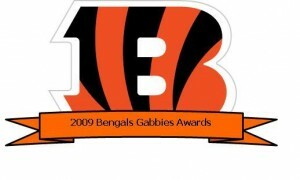 Check out Bengals Gab tomorrow as we unveil our first 2009 Bengals Gabbie, the Anthony Munoz award! Wow, that’s some list, it’s just a shame that none of them won a Super Bowl Ring with the Bungals. The Tim Krumrie award should be for the player deemed to be faking an injury to stop an offences momentum. You need to add a Chad O-so-stink-O award for the biggest cry-baby after another Wild Card Round Playoff loss.